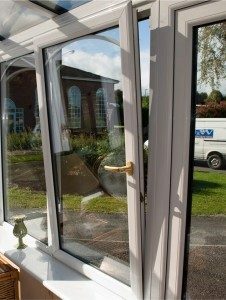 From any angle, uPVC Tilt & Turn windows are unique, functional and stylish. These windows are often called the ‘Continental Window’ are versatile by being able to function as both a venting window and an inward opening ‘door’. The potential uses for tilt and turn windows are numerous and being able to open tilt & turn windows in more than a few different fashions is not only ingenious, but also practical. The variable inward opening panes make cleaning an easy task, especially where fitted to higher floors, brings added low draught ventilation to the home. it’s also less inviting to intruders than leaving a side-hinged window wide open. It is often used as a fire egress window and a combi-window for Georgian style installations. A lesser highlighted function in terms of safety is that, because the tilt & turn window can fully open inwards giving a very clear opening, they are excellent to use in places where an emergency exit point is required. For safety, toughened glass meeting British Standards is used in high-risk areas, this glass is about 5 or 6 times stronger than the average pane of glass and in the event it breaks it reduces to very small pieces – similar to the effect you may have seen on car windscreens in the past. As you would expect, for security reasons, robust and efficient locking systems are installed as standard and high-security locks built into the frames keep you safe from burglars or otherwise uninvited guests hence Turkington multi-point locks are standard.